As commercial aviation witnesses a phenomenal boom across the world, more and more women are passionately striving to become a part of the industry. Women in airspace have transitioned from being employed as flight attendants to premier cockpit controllers. Today, a fifth of students enrolling for a commercial flying licence in India, the world’s second-most populous country, are women, which is way higher than other countries. HE Jameela bint Salem Al Muhairi, Minister of State for Public Education, was one the speakers at last year's edition of WIA ME General Assembly. 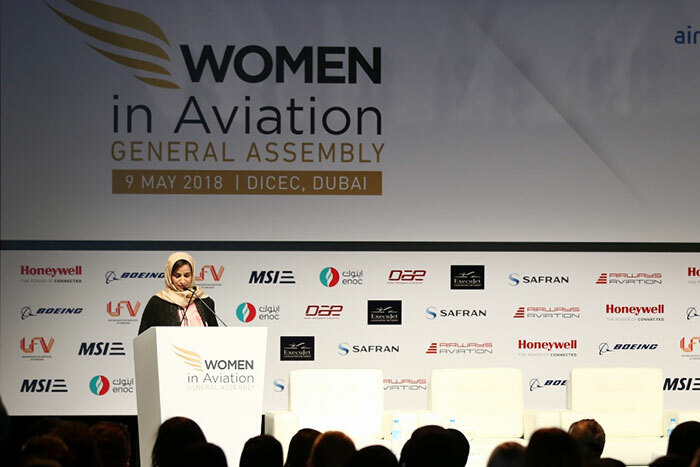 The 4th Women in Aviation (WIA) Middle East General Assembly will be held in Dubai on 1 May alongside the 19th edition of Airport Show, under the patronage of His Highness Sheikh Ahmed Bin Saeed Al Maktoum, President of Dubai Civil Aviation Authority, Chairman of Dubai Airports and Chairman and Chief Executive of Emirates Airline and Group. The event will focus on the growing contribution of women in aviation globally and share best practices from around the world for over 400 attendees expected at the Dubai event. The sponsors are: Air BP, Airbus, Boeing, Dubai Aerospace Enterprise (DAE), Falcon Aviation Services, Honeywell, LFV Consulting, MSI Air, Safran, Saudi Air Navigation Services, Strata and Yahsat. Key sessions will focus on initiatives that can help women succeed in the aviation workplace and help organisations meet ICAO’s gender parity goals, the influence of social media in the changing workplace and work-life balance issues with respect to female employment, as well as a systematic guide on how to enhance gender equality in the aviation workplace. The conference will also look at the role women are playing in the development of the region’s ambitious space programmes, especially in the United Arab Emirates. Prince Fahd bin Mishaal Al-Saud, Vice-chairman of Saudi Aviation Club (SAC) and Chairman of GCC Aviation Authority and Sheikha Al Maskari, Chief Innovation Officer, UAE Space Agency, will address the gathering. The other confirmed speakers include Robert J. Gerritsen, General Manager, Air BP MENA, Al Jwahrah Al Theyeb, HR Manager Saudi Arabia, Boeing, Barbro Bolander, HR Director, LFV Consulting, Bernie Dunn, President, Boeing MENAT and Filiz Hayirli Tepebasi, Turkey Strategy Manager, Boeing. Also addressing will be Haifa Hamedaldean, Transformation and Project Manager, Saudi Air Navigation Services, Lisa Holzmann, Deputy General Manager, MSI Air, Lisa Lyons, Vice President Trading, DAE, Maryam Al Balooshi, Manager - Environment Studies at General Civil Aviation Authority (GCAA), Nadine Fanous, Associate Director Industry and Government Relations, Boeing and Patrick Natali, General Delegate Middle-East, Safran. The other speakers are Rana Dajani, Associate Professor, Hashemite University, Sonja Strand, Vice President / General Manager – Global Airports, Honeywell, Suaad Al Shamsi, Senior Manager - Midfield Programme, Etihad Airways and Zeina El Hakam, Communications Manager, Boeing. Estimates from the International Society of Women Airline Pilots show there are 7,409 women pilots across the world accounting for 5.2 per cent of total pilot workforce. Women make up about five per cent of the 53,000 members of the Air Line Pilots Association (ALPA), the world’s largest pilot union. It estimates that between three and six per cent of pilots at the world’s largest commercial airlines are women. Representation of women on the ICAO Council is seven out of 36 members. The organisation is committed to a 50-50 gender parity by 2030. According data by the ICAO, only 5.18 percent of pilots are female.